Technique | Kaleido by Silkie B.
I knitted my very first pair of socks using 5 dpn, the traditional way what a lot of knitters think. Although the socks came out great for a first timer in socks knitting, I wanted to have an easier way to knit socks. Then a couple years ago, I heard about people talking about the Magical Loop method, I also heard people saying about knitting a pair of socks using 2 circular needles. I wasn’t sure how I felt about the magical loop method when I first heard it… but since handknit socks are in everyone wish list for the holiday, I was willing to try different method to knit socks faster. I finally did some research on the magical loop method and try it. And I totally love it. Since mastering the skill, I have knitted more than 10 pairs of socks and I also using magical loop method method for fingerless mitten, finger mitten and hat. Since most of the socks patterns are written in 5 dpn, so I have figured out a basic sock pattern to use magic loop. I have so much fun knitting socks and mitten, I have started designing pattern for socks and gloves for using the method. Here is a design that was published in the November issue of Creative Knitting magazine. 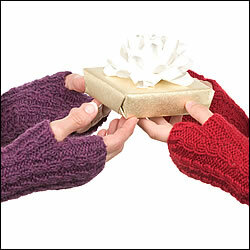 The fingerless mitten is knitted using magic loop method. In case anyone who is not familiar with the magic loop method, a magic loop is actually a long circular needle, a circular needle with at least 32″ long, preferable with circular needle that has very flexible wire, such as needle from KnitPicks or Audi Turbo needle. 1. Cast on an even number of stitches (sts) and slide sts to middle of cable. 2. Divide sts in half and pull cable loop out between two groups of sts. 3. Slide sts down to their respective needle tops. You will have half of your sts on each needle tip. Hold needle tops parallel and pointing to right, working yarn will hang from back group of sts (I’ll call the sts as group 1, and the front group of sts as group 2). 4. Pull the needle tip out (will be group 1 sts) until you have enough cable to allow you to work sts (group 2) on front needle . 5. Work all sts on front needle, being careful not to twist. 6. Turn work and make sure the working yarn is hanging from back and needle tip point to the right. Slide the front group of stitiches to the needle tip then repeat step 4 as many times as needed. So here is the simple way of magic loop method. The first few rows might look a little different because there might seem to have a gap in between the join of the round. However, as you continue working, the gap will automatically closed up. It might seem awkward to knit a pair of socks using the method at first; however, once you get familiar with it, it is a piece of cake. Different people addicted to different things whether the thing is an object; shoes or ice-cream or an action such as shopping or surfing internet. As for me, my object of addiction is felting, felting purse especially. I am relatively new to felting. I started felting about 4 months ago when I saw my neighbor Ann took a ‘Learn to Knit’ class in a local yarn store. Ann learnt the basic of knitting, such as cast on, bind off, knit and purl stitches. She also learnt to knit and felt a bag. I saw Ann’s purse before it was felted and I was puzzled and confused. The knitted version looked so fragile, the stitches was so loose and it did not look practical and sturdy at all. But when I saw the purse again after it was felted, I was amazed by the transformation. I could not help but wanted to make a purse myself. My very first purse was a pattern I found on the internet. It was very simple and a relative small in size. The purse only requires one skein of yarn. For my first try, I did not want to make a big one because I did not want to waste money and time if any disaster strikes. I knitted the purse rather quickly and tried to felt it by following the felting instruction came with the pattern. Unfortunately, the instruction was written for top loader washing machine and I could not get my purse to felt in my front loader. It was discouraging. Instead of figure out how to do it in my machine, I ended up asked my friend, Wendy, to felt the purse for me because she has a top loader machine. Even after all the misfortune of trying to felt my first purse, I was hooked after Wendy handed me the felted purse – my first felted purse. The purse looked so cute and beautiful (at least in my eyes it was) that it made me forget all the bad experience. How can you tell I am a felt addict, especially felted purse addict? 1. I found excuse to go to yarn stores to search and buy feltable yarn. 2. I have basket and basket of feltable yarn in all brands, weight and colors. 3. I keep buying purse hardware even though I have no idea when I will use it. 4. I borrowed and bought ton of books about felting and purse from library and book store. 5. I knit in big fat needle. 6. I knit during my trip to my sister-in-laws cottage instead of enjoying the great outdoor. 7. I have felted purses hanging in my deck to dry all the time. The list can go on and on. I do not mind people call me the purse lady. I love making purses and I am proud of it. My neighbor, Karen, saw me and Ann knit that she herself started to knit and felt as well. Karen knows how to crochet and knitting is rather new to her. But after her first purse, she was also hooked. Karen starts to ask me questions about felting. I am no expert but I made enough mistakes along the way that I could share some of my experience in felting to her so that she did not need to go through the mistakes like I did. And now, I would like to share my 10 felting tips to anyone who is interested in trying out the beauty of felting. For a new felter, I would highly recommend to find a simple pattern to start. Follow the material and notion sections to get your supply. There is not a strict rule to get the same yarn that mentioned in the pattern especially if the pattern only calls for one main color feltable yarn. However, if you are working on a pattern that required more than one feltable yarn, then try to stick with same brands yarn for all colors. Not all yarns are created equaled; hence, all yarn felt differently. When buying yarn for felting, you would like to choose yarns that are feltable. Yarn such as 100% Wool or Alpaca will felt beautifully. There are also other yarns, such as Soy/Wool blend yarn and mohair will felt beautifully as well. DO NOT use superwash yarn even though they are 100% Wool. Superwash wool is treated to be used in washing machine. I am going to say it again, ‘Not all yarns are created equaled.’ Even though the label says 100% Wool, but different brands of 100% Wool felt differently; they can be different in gauge, felting time and even felted surface. If there is a reason why you will need to use different brands of feltable yarns in one single project, make sure to do a switch for each of the desire yarn and felt them to make sure the felted results are compatible before using them in a project. The sizing information on the pattern is always an approximation. The final felted sizes usually depending on the yarn, the way you knit (tight or loose) and the length of the felting process. There are a lot of factors come along with felting. If your felted item is smaller or bigger, it is really no big deal. If the sizing of the purse is important to you, I would recommend knitting a switch before started any project; hence, you can adjust the number of stitches and needle size before starting. A lot of people will tell you that felting is very forgiving. If you made a mistake; such as drop a stitch or have a hole on the purse, you don’t really have to fix it because after the purse is felted, the hole will not show up. The statement is not always true. It is true that felting is very forgiving, it helps to hide a lot of mistakes; however, a hole is a hole, in a case where you have a hole on your knitted piece, you will like to fix it because the hole will still show up after felting. If you are making a purse and would like to attach a pair of wooden handles or apply D-ring to the purse. Do not attach them until the felted purse is completely dry. You can always attach them by using yarn or sewing thread (hand quilting thread works the best) and sewing needle later. Depending on the machine you use, the felting time varies. The most ideal scenario is to have a top loading machine because you can adjust the water temperature and level; it also shorten the felting time. However, as the front loading machine is more energy efficient and most likely, you will have a front loading machine. Not too worried, a front loader does felt; however, it takes much longer to felt. If felting with front loader, you would like to set the machine to hot/cold cycle, put your knitted piece in a zip pillow case, a little hand soap and a pair of old jean. A lot of time, it will take at least a full cycle or two to felt. Be sure to check your item often to prevent too much felting. One key thing, do not let your felting item to go through the spin cycle because the spin cycle will change the shape the purse. I also like to recommend using a color catcher when felting especially if you are felting a very light color item and you have a pair of old blue jean in the machine in case of the color of the jean bleed. Most likely, after the felting process, the felted item will change its shape because of the washing and spinning of the machine. Hence, make sure to stretch and pull the felted item to the shape that you want. When the felted item is wet, it is OK to stretch it. The felted surface is strong enough to endure any kind of stretching. You would also want to cut a piece of plastic to put at the bottom of the purse if a flat bottom is desired. Put an empty box (according to the size of the purse) inside the purse when drying is very effective to shape the purse. For any reason if the shape of the purse is not what you wanted after it is dry, you can always make the purse wet again and reshape it. After the purse is felted, it should be strong enough to carry around especially if using double strands of yarns during knitting. However, you might want to consider lining the purse. The lining does not only give the purse a more finish look, but also increase the duration of the purse. You can also add heavy interfacing to the lining fabric to increase the sturdiness of the purse. The lining of the purse can be time consuming because of the hand sewing work but it’s not rocket science. If lining is not your thing, I will higher recommend using a piece of plastic (plastic canvas work the best) and sew it in the bottom of the purse to give it a more firm bottom. Even though lining is time consuming but consider all the benefit of lining; it will make the hard work all worth it. After all the hard work you put in to the purse, you should always show it off. After all, if you don’t use the purse, why make it at the first place! I must warn you, felting is addictive. Once you start, it will be hard to stop. And you might turn into a felt addict just like me!